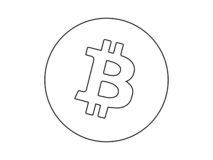 Bitcoin logo line drawing vector money bag icon vector. Thin line money bag outline icon vector illustration.money bag symbol for use on web and mobile apps, logo Money Arrow Chart Finance for logo design illustration Money banknotes outline icon - vector minimal cash symbol or logo element in thin line style Money coins icon / logo. Art illustration cash money isolated icon. simple element illustration from payment methods concept icons. cash money editable logo sign symbol Dollar, bitcoin, yuan. Vector illustration Green modern and Colorful Accounting finance Template Logo and Icon Dollar heart in green color.